Chamber Breakfast Meeting "Meet the Congressional Candidates"
Name: Chamber Breakfast Meeting "Meet the Congressional Candidates"
‘Meet the Congressional Candidates’ at September's Chamber Breakfast Meeting. 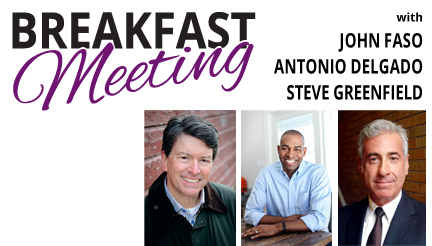 Incumbent Republican Congressman John Faso, Democrat Antonio Delgado and Green Party candidate Steve Greenfield will be speaking and answering questions posed by members of the audience. Don’t miss this opportunity to see and hear the candidates for Congress in New York’s 19th District. The League of Women Voters will be facilitating this Chamber ‘Meet the Candidates’ event. Chamber Breakfast Meetings are a great way to network with local business leaders and stay on top of current events.